The global statistics of child-death under 5 years of age is very alarming. Twenty children per minute die, mostly from preventive causes, almost all in underdeveloped/developing world. While neonatal death (first day death) itself accounts 1/3rd of the global child-death, neonatal jaundice (higher bilirubin level at birth) is significantly responsible for neonatal death or otherwise results in kernicterus causing irreversible brain damage. A large portion of neonatal deaths depends on maternal health during pregnancy. Prematurity in child birth and associated complications in neonates are common hitches in jaundice in pregnant women. In Bangladesh, published literature show that 58% of death in pregnant women with jaundice, are due to hepatitis E virus (HEV). In India, HEV virus causes jaundice in 70% pregnant women. In a careful clinical research it is found that (J. Obstet. Gynecol. India 55 (2005) 424) maternal mortality is directly proportional to the level of serum bilirubin. An early diagnosis of the neonatal and maternal (due to HEV) jaundice is concluded to be an important step toward preventive measure of the casualties. .
Current gold standard to measure bilirubin levels in total serum bilirubin (TSB) determination from blood sample obtained by invasive way. Although the method is proven to be successful in monitoring neonatal and maternal jaundice, it has several drawbacks. Invasive blood sampling is painful and stressful for the neonates, resulting in blood loss and an increased risk of osteomyelitis (Ann. Clin. Biochem. 45 (2008) 452) and infection at the site of sampling. In addition, which is particularly important in the developing world, the conventional method is costly, laborious and time consuming, lacking the possibility of immediate diagnosis (Pediatrics 129 (2012) 689). The possible alternative for invasive blood sampling is transcutaneous bilirubinometer (BilicheckR is the commercial version of the device) that provides instantaneous cutaneous bilirubin concentration (TcB). The method is based on optical spectroscopy that relates the amount of light absorption by bilirubin (yellow skin) to the concentration of bilirubin in the skin. Since its discovery in 1980 (Pediatrics 65 (1980) 195), several more devices have been developed in order to improve the accuracy of the device. However, even after 30 years of development, still no subcutaneous bilirubinometer can replace blood sampling for the following reason. Firstly, the variation of accuracy in different skin color. Most importantly, the bilirubin measured by transcutaneous bilirubinometry (TcB) is completely physiological different parameter from TSB in blood because TcB consists for over 99% of the concentration of extravascular bilirubin. Due to largely unpredictable processes that regulate the supply and clearance of bilirubin in the extravascular space, 1 to 1 comparison of the TcB with TSB is impossible. Therefore, trancutaneous bilirubometry (BilicheckR for example) will not replace the invasive bllod sampling given the expectation that TcB should be equal to TSB. . . In order to overcome above limitations of non-invasive bilirubin monitoring device following two strategies are only alternatives: (1) a medical approach, requiring extensive risk analysis for the predictive value of TcB for the mortality/morbidity. (2) A technological approach, where measurement volume of the device is essentially confined to intra vascular space, enabling a 1 to 1 comparison of TcB and TSB. Our innovation is basically adopts latter strategy where spectroscopic signal essentially comes from the vascular bed of bulbar conjunctiva (white portion of our eye). As the conjunctiva is white in all human subjects across variety of races, the accuracy of the proposed device is independent skin collar. Expected light power in the visible region (400-700 nm) required (~20 microwatts) for such investigation is much lower than that used in commercially available opthalmoscope (~100 microwatts) for regular eye check-up, given the sensitivity of the state of the art spectrograph used in the proposed device. Thus the features of the innovation which make the device distinct from the existing non-invasive devices for jaundice detection are as follows: (1) Directly monitors amount of bilirubin in blood (intensity of the absorption peak at 470 nm) with extremely high precision without any interference from other pathological condition. (2) Non-contact device does not need any mechanical attachment to the subject, which is very important for the friendly use of the device in neonates/young infants and also virus infected (HEV) maternal subjects. (3) Signal from conjunctiva, which is white in all human subject independent of skin color offers uniform sensitivity across different communities in a country. (4) Almost zero maintenance cost. Capital cost recovery in 5-7 years of use. (5) Online monitoring and compatibility with android mobile phone for remote diagnosis. (6) Very limited or almost no training would be required for the healthcare provider. .
(a) Schematic representation of the proposed device. The light from the source is transmitted through the six-channel excitation fiber and incident on the conjunctiva of the subject. 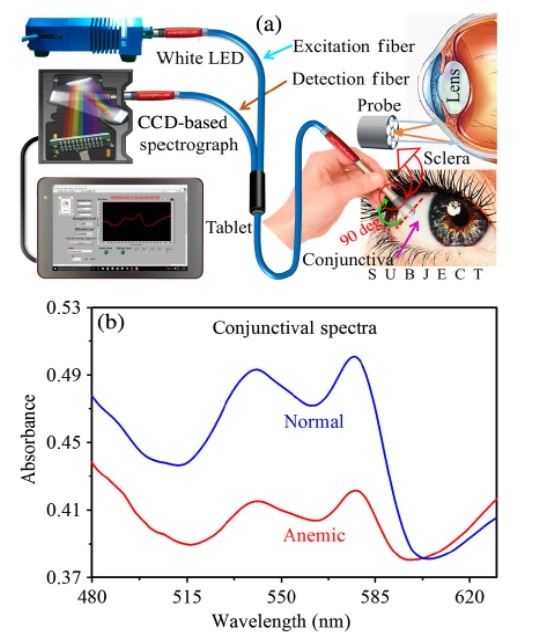 The diffused light from the conjunctiva is collected using the single-channel detection fiber and transmitted to the spectrograph. The corresponding spectral response is processed and generated in the tablet. (b) Comparative spectral response of (b) Comparative spectral response of the conjunctiva of a normal volunteer and anemic patient. 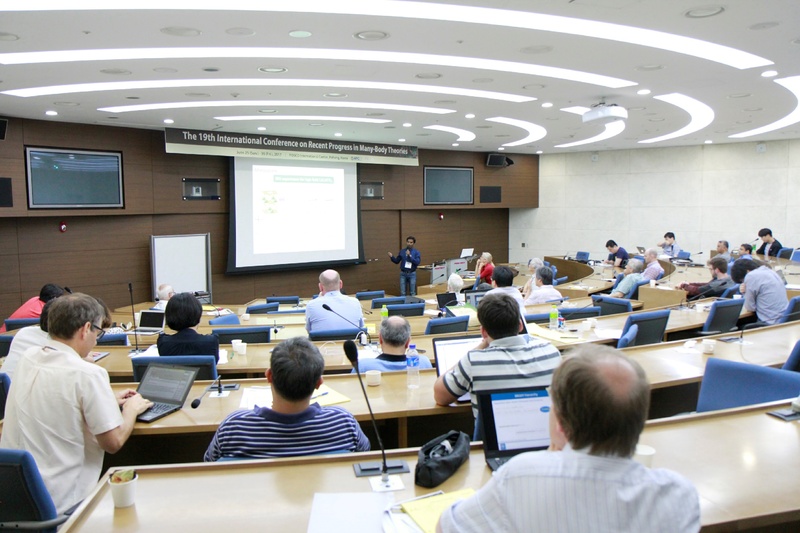 Mr. Aslam Parvej, Senior Research Fellow of the Centre talked on "Multipolar phase in frustrated spin-1/2 and spin-1 chains" in "The 19th International Conference on Recent Progress on Many Body Theory" organized by Asian Pacific Centre for Theoretical Physics (APCTP) at Postech Campus, Pohang, South Korea during June 25 - 30, 2017. A "Hindi Essay Writing Competition" was organised in the Centre on 13th July, 2017 for students of Class 9 & 10. 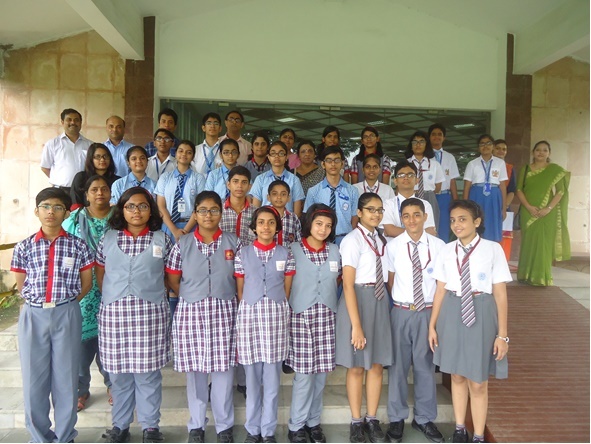 Total 25 students of 5 different schools- Kendriya Vidyalaya No. 1, Kendriya Vidyalaya No. 2, Salt Lake, HariyanaVidyaMandir, APJ School and Bhartiya Vidya Bhawan participated in this competition. Aishika Rakshit (Class-X) of Kendriya Vidyalaya No. 1, Salt Lake, Priyanshi Singh (Class-X) of Bhartiya Vidya Bhawan, Shreya Jana (Class-X) of Kendriya Vidyalaya No. 2, Salt Lake won 1st, 2nd & 3rd prize respectively. All the participants were awarded a consolation prize and Certificate.